Sean O'Rourke set the FKT, 10h12m, June 30, 2015. The previous FKT was Leor Pantilat, 11h06m, July 16, 2009. Mount Olympus is the highest peak in the Olympic Mountain Range of Western Washington. Despite it's relatively low altitude [7965 feet], Olympus is heavily glaciated due to it's close proximity to the Pacific Ocean. Precipitation in the nearby Hoh Rain Forest ranges from 140 to 167 inches--12 to 14 feet--every year, which translates into a lot of snowfall on Olympus, thus maintaining large accumulations of ice such as the Blue Glacier. Located in the center of Olympic National Park, Mount Olympus is also quite remote, and requires a 1 day hike just to reach it's base. The "standard" route is approached via the Hoh River Trail, a 17-mile each-way excursion through one of the wettest places on earth. From the base camp at Glacier Meadows, the route is a straightforward glacier climb with moderate crevasse danger. Rope, Crampons, ice axe and crevasse rescue gear (not to mention knowledge on how to use them) are prerequisites. 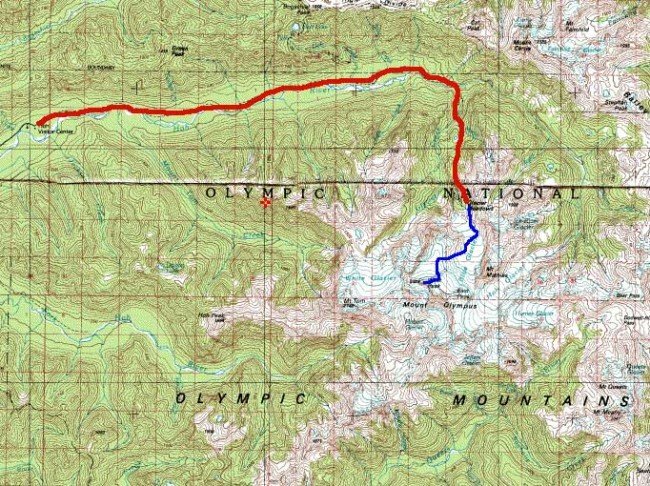 -- from www.summitpost.com. Olympus was outrageous ... as expected. I was only the 7th party to sign in this year. 18 miles to the bottom scares 1/2 the people off, then the glacier ascent scares off the other 1/2. Almost scared me off too ... I found an 8' log and carried it under my two arms to cross the glacier. Caught up to two guys with full gear at the final icefall, but then they got scared and turned around. I kept going, but it was sketchy ... one crux move over a crevasse onto a 45d slope of slush was not fun. If something breaks loose, there's nobody up there, no one will even know, let alone bother to try a rescue. 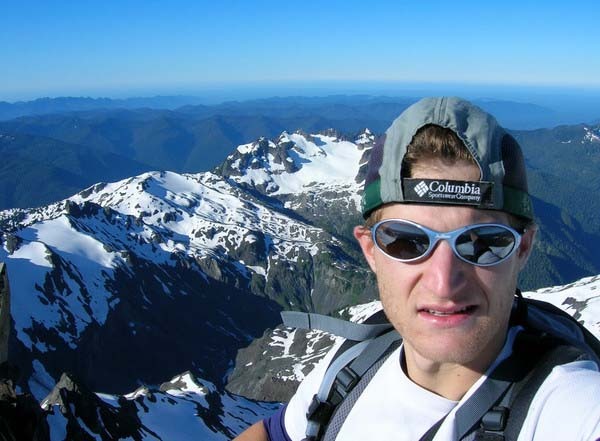 On July 31, 2007, Leor Pantilat obliterated Buzz's FKT on Olympus, making the 45-mile car-to-car trip in 11h30m. He reached the summit in only 5h55m. Leor's trip report with many photos & detailed splits is here. Remarkably, Pantilat went back in 2009 and beat his own FKT by 24m, ticking it off in 11h06m round trip, 5h50m to the summit. "Aside from a few minor differences ... everything from the weather to route conditions were essentially the same as in 2007," says Pantilat. His full trip report with photos is here. Pantilat's record stood for 6 years until Sean O'Rourke's outstanding 10h12m on June 30, 2015. O'Rourke gives splits below - his ascent time was 5h35m - along with a link to his full trip report. Sean O'Rourke (Dr Dirtbag) just broke this record. Light crampons are extremely nice when crossing the lower Blue Glacier, whose uneven, bare glacial ice would be somewhere between annoying and treacherous otherwise. The upper glacier had enough surface snow and a low enough angle to make crampons and ice axe unnecessary. Crevasses are easy to avoid, but apparently block the more direct finishes. The final summit climb from the high-point of the snow felt 5.0-5.2.